What inspires me to write? Anything and everything. 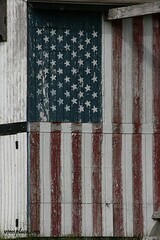 I’ve been staring at this photo that I picked to decorate my July 4th music post this morning. It’s called Faded Glory for obvious reasons. But did Claire, who posted it, have something more in mind when she named this photo? Are the fading colors of old glory a metaphor for more? I read a piece in the NY Times last weekend I think, which I won’t try to link to because it’s behind the Times Select wall, which compared our current state of affairs in this country to the end of the Roman Empire. That’s probably a bit too harsh, but is the glory of our country fading? Jason Chervokas’ July 4th podcast includes a recording of Whitman reciting his poem America which I’ll cut and paste here since its so short. This is a notion of America that we probably have never lived up to. But aspirationaly, this is what America is. Equal. Fair. Strong. Rich. Enduring. A grand sane towering seated Mother, Chair’d in the adamant of Time. Of that I am not so sure.